Cherie Beck Harp-Baird is only 53 years old. I have known her for 21 of those years. She is a very strong woman and a great mother, grandmother, wife and friend. She is fun loving, she loves to celebrate just about every event on the Hallmark Calendar, especially ones you can make or wear a costume to and then some! She has a real zest for living life and shares that with everyone she meets. But, now her life long dream with her husband and soulmate; her very life, has been cut short by IPF. What is IPF? Idiopathic (meaning cause is unknown) Pulmonary Fibrosis (meaning scaring of lung tissue). IPF is a family of 200 VERY RARE lung diseases, for which there is NO CURE. You don’t get IPF by smoking, (something Cherie NEVER did), or by genetics. They really don’t know what causes it. 40,000 people die from it each year. The scarring of the lung tissue, makes it impossible to breathe well and get enough life giving oxygen into her bloodstream. She is slowly suffocating and as her body can’t get enough oxygen it swells with fluid endangering her heart and threatening congestive heart failure. Last month, they just celebrated their seventh wedding Anniversary, and sadly, it wasn't on their boat on some sunny island, as they had planned. It was in a rented house, with Cherie attached to an oxygen concentrator........just recently out of ICU. While docked on Lake Pontchartrain, in Louisiana, a cough that had plagued Cherie for a while, became very severe. 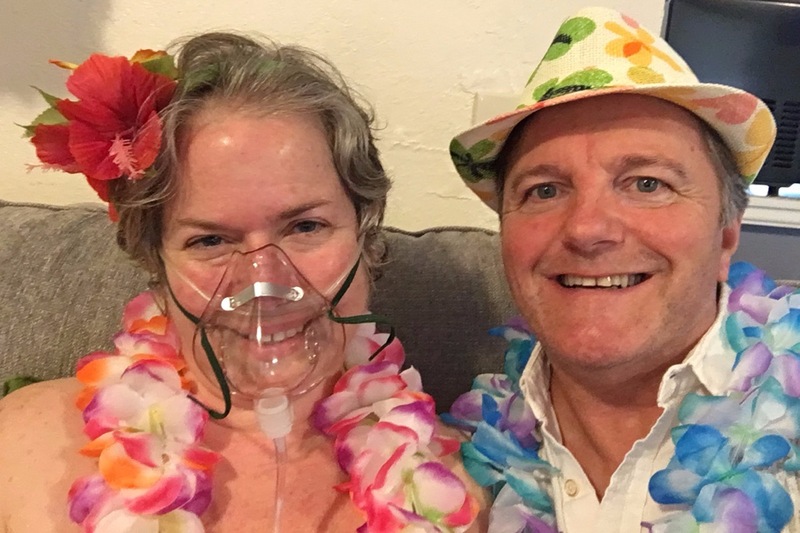 In August of 2018, Cherie was diagnosed with IPF. Between then and now, the disease progressed extremely quickly. The Doctor’s call it Acute Exacerbation. In August, she went from using no additional oxygen, to now using 17 lpm (liters per minute) on three high flow oxygen concentrators, JUST lying down at rest! Under exertion, she uses 25 lpm! Exertion, which is just sitting up, moving into her wheel chair or trying to feed herself. This disease has cut short their dream and their life together. With each passing day, the tightness in her chest, makes it harder and harder to breathe, causing overwhelming anxiety - and still, she constantly rallies herself, through her family, her great faith and her friends. Her children and her grandchildren keep her going. She recently learned that her son Tim and his wife will be expecting their second child. Another reason for her to persevere and stretch her remaining time out as long as possible. She wants to be in Dallas near her children and grandchildren for as long as she can. This brings us to the URGENCY of Cherie's situation and the reason for our fund raiser. Cherie is presently on Hospice in Louisiana. Her dying wish is to be moved to Hospice in Dallas, Texas, to spend her remaining time near her children and grandchildren. She hopes that she will gain enough strength, to be eligible for a lung transplant, God willing, which may give her a few more years. This is a monumental and very expensive undertaking, as she requires very specific medical air transport to meet her extreme oxygen needs. Both she and her husband (her primary care giver) have depleted most of their money and both of their 401K accounts. We need to raise $30,000 - $35,000 immediately, to cover the cost of her medical air transport and any other medical costs resulting from the move. Time is of the essence, she must be transported VERY SOON. Additionally, they have listed their Sail Boat for sale, to use to pay their staggering medical and medical equipment bills. Insurance has been extremely problematic under the Affordable Care Act. The Doctor they need in Texas doesn’t take any of those plans and they can’t afford anything else. please contact us through GoFundMe. Cherie has very little time left, we need to raise the medical air transport money ($30,000-35,000) and to sell their sail boat immediately. Please help my very dear friend, realize her dying wish. Because of Cherie's illness and limited mobility, I have set her husband, Robert, as the primary beneficiary to retrieve funds on her behalf. THANK YOU ALL FOR YOUR PRAYERS, WELL WISHES AND SUPPORT - on behalf of Cherie and Robert, God Bless you!